The holiday season seems to have kicked into gear here in Meaford. At Meaford Hall, the Unique Boutique has already come and gone with its huge array of, well, unique and wonderful offerings and gift ideas offered through a silent auction. Last weekend, the merchants of Meaford took off the paper and sheets covering their windows, so a stroll downtown welcomes you with holiday reminders at every step. 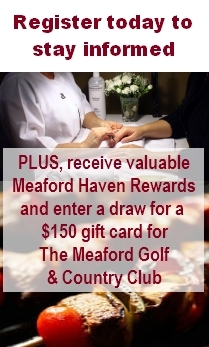 You’ll also find gift baskets and gift certificates, and you can chase away the chill with a warm seasonal drink. 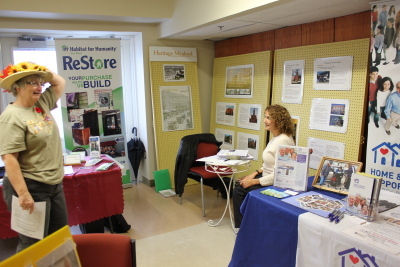 Last week we mentioned Meaford’s Volunteer Fair, held as part of “Focus on Seniors” at Meaford Hall. Focus on Seniors also features a free speaker series directed at retirees, which kicked off at the Volunteer Fair with a talk on volunteering. Tomorrow, the series continues with an introduction to genealogy packed with tips and ideas to get your started on exploring your family tree. Carole Stuart, Coordinator of Local History and Genealogy at the Collingwood Public Library will fire you up with practical advice on how to take the first steps to discovering more about your family’s past. Every second Wednesday (with a short break over Christmas) at 1 p.m. – right up until April 17 – you can meet with others at Meaford Hall to enjoy a social gathering, light refreshments and stimulating talks. Upcoming topics include how to avoid the “winter blahs”, financial advice, and intriguing presentations on everything from our local apple and agri-industry to one writer’s case for the theory that ancient Celts visited Ontario. If you need accessible transportation, simply call the Hall Box Office at 519.538.0463 to book a free ride.